Poor indoor air quality poses potentially serious risks to your health. From causing headaches and dizziness, to aggravating existing health conditions such as asthma and allergies, and exposing those in your home or business to pathogens including viruses and bacteria, a dirty climate control system creates numerous problems. Aside from regularly cleaning your residential or commercial heating and cooling system’s ductwork and internal components, it is also important to address your system’s humidity level, ventilation, and filtration system. Ultraviolet germicidal lights are very effective at eliminating pathogens from dispersal. Climatrol is a licensed indoor air quality contractor serving residents in Clarksburg, as well as Bridgeport, and throughout our entire West Virginia service area. We have the solutions that you need to improve your indoor air quality. Your home or office must be maintained at an appropriate humidity level for the comfort of those living and working there, as well as to maintain the integrity of the building and its contents. If the climate is too dry, cracks will appear, and if kept too moist, mold and mildew will destroy the materials. Proper humidity management helps to moderate the temperature, save on energy expenses, and keeps dangerous pathogens from proliferating, as well. Adequate ventilation with fresh air is a cost-effective method of improving the quality of your indoor air. By diluting the concentration of carbon dioxide, off-gassing from building materials, and other chemicals and contaminants, air quality and freshness can be dramatically improved. If your building has been constructed tightly and with little natural ventilation, a professional ventilation system is essential to eliminate stale, polluted air and replace it with cleaner and fresher air. 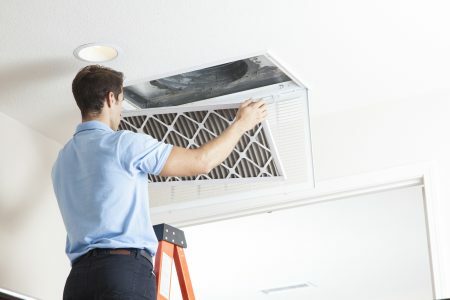 The first step in preventing harmful contaminants from reaching the internal components of your HVAC system is a proper filtration system to trap these unwanted materials for easy disposal. Clogged filters must be replaced with clean filters at least twice per year to maintain energy-efficiency, as well as their filtration capacity. Airborne dust mites, dirt, pollen, mold spores, and bacteria can be captured and disposed easily with regular filter changes and maintenance. A standard for our hospital, medical clinic, commercial offices, and industrial sites, these units are also highly sought after by homeowners suffering from immune conditions, chronic illness, and those who simply want to breathe clean, fresh, air. Contact Climatrol to learn more about how we can help improve the quality of your indoor air. Most individuals spend 90% or more of their time indoors. Let us assist you with enjoying each breath and maximizing your system efficiency. Call for a free quote: (304) 623-0606.